What is A Special Grace ? A Ministry in the Episcopal Diocese of Massachusetts, currently based at Church of the Epiphany in Walpole, MA. A Special Grace uses the Rhythms of Grace curriculum for some of our worship services. We also augment this curriculum, as well as adapt other curriculums and worship service materials to suit our congregation. 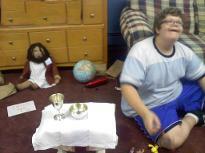 providing a sensory-appropriate environment for worship and Christian formation. For instance, we do what we can to minimize echoing and loud noises. Any music we offer is either a single voice or a single instrument played at a low level. Our worship area is comfortable, with rugs and couches. A small tent is offered for the use of those who need a "safe place." Sensory aids are always available, including lap weights, a weighted vest, soft "Kushie" balls, and lamb's wool fidgits. Instruction or direction is offered visually, with words, pictures, a "countdown" clock and a "what's next" board.